With the Academy Awards this Sunday (also known as the The Oscars), many are putting in their predictions for Best Picture. But what are these predictions based on? As the big day approaches, I dove into our rich trove of user data to identify a winner. I focused on which film will win Best Picture and will walk though a few ways we determine the winner. At Exponential, we are able to describe an audience through any one of 50,000 characteristics. In comparison, any approach based on a few demographic variables seems quaint. Aside from ice cream and golf clubs, there are few things where simple demographics like how old you are (or how white you are) prove more important than what you’re interested in or thinking about. An argument can be made that entertainment is heavily influenced by demographics, but in most cases, we find that demographics alone do not answer all of our questions. For example, there are probably few parents watching MTV’s Teen Mom. If the show moved to Oxygen, I’d bet viewership would shift drastically. And who would have guessed that a PBS drama could pull in an astounding number of women ages 35 to 49? At the very least, to turn a phrase, demography is not destiny. So what if the Oscar voters were driven on demographics alone? 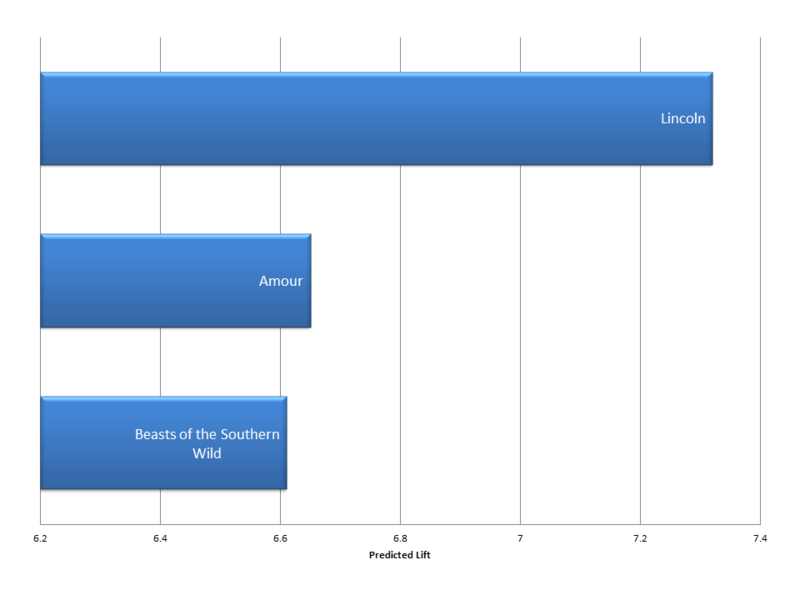 As we would expect, an older white male vote would translate to a win for Lincoln, a movie about (yes) President Lincoln that has been compared to watching C-SPAN in both length and excitement. But this approach would also assume that retired music teachers would love Amour and Beasts of the Southern Wild would get voters who are girls living in the Mississippi Delta. Not only is this unintuitive, but according to InTrade, these films are least likely to win. Surely, there is more to this award than demographics alone. As you might expect, if Los Angeles were voting, the winner would be the movie about a creating a movie. That is – Argo. Again, this approach suffers in its simplicity. It is the least predictive of our four approaches because plenty of non-creative types live in Los Angeles. There are so many people living in sprawling Los Angeles that the data is too noisy to make an accurate prediction. The third approach might be the “single bullet theory” – to look for one data point that describes the audience of each movie. At the Huffington Post, Michael Hogan and David Rothschild hope to do for the Oscars what renowned statistician Nate Silver did for last year’s election. What they seem to miss (at least at first glance) is that when you have 30 singular outcomes and even more variables, some strange detail is going to take on outsized importance. Hogan writes that “movies that see a jump in revenues between their fourth and fifth weeks after release are especially likely to win Best Picture”. This reminded me (of all things!) 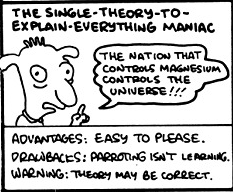 of an old “School is Hell” cartoon where a professor is attached to a single bizarre theory. I shouldn’t throw stones, of course. These odd outliers can be a fun way to describe an audience. 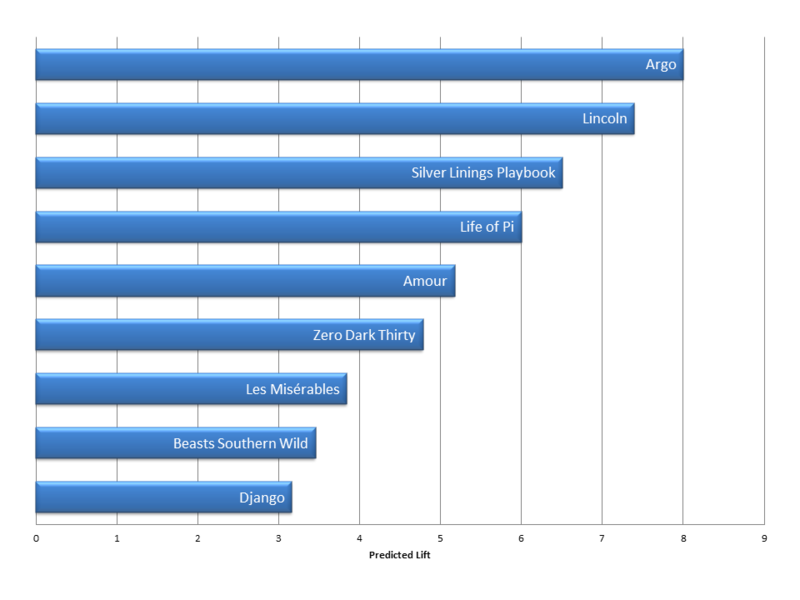 Let’s look at the one data point that is most descriptive of our Best Picture audiences. * I couldn’t believe this when I saw it either. It is related with this audience’s love for yoga and fitness, rather than being stranded in the middle of the ocean. The danger in this approach is obvious; basing a whole prediction on just an outlier (or two) is, again, too simple and may even lead us in the wrong direction. For instance, consider that the characteristic most predictive of watching an Oscar contender is ownership of a Nokia smartphone, but that Nokia has less than one percent of the market. Are all Nokia phone owners Oscar’s enthusiasts? Or vice versa – are iPhone or Android phone owners not Oscar enthusiasts? Obviously not. For what it’s worth, the single-bullet theory here, based on Nokia ownership, gives the win to Life of Pi. Of course, those data points hardly seem predictive. Ultimately, small data points are powerful, but only useful when layered with thousands of others. We save the best strategy for last – look-a-like modeling. We know that one of the most important goals in marketing is to align measurement with your objectives. So if our objective is to accurately read the audience, and the audience consists of actors, directors, writers and other creative, why not profile these professions through look-a-like modeling? The idea sounds simple, but unfortunately, we are not in a world of complete information. Any marketing profile is bound to be incomplete. In this case, we know a fraction of our users are in the film industry, but only a fraction of those people exhibit an Oscar preference. We simply do not have the volume. As with an advertising campaign, we can solve this problem through look-a-like modeling – or taking what we already know about a similar audience based on previous campaigns, audience insights, statistics, and other behavioral data we’ve gathered to accurately fill in the gaps. We know, among other things, that film professionals are much more likely to purchase a sports car in September, and they have a pronounced affinity for high-end clothing. Using thousands of these characteristics, we can identify similar users for which we do know film preference – which are highly correlated with our target audience. This look-a-like model gives us the clearest picture into Oscar preferences. If I hadn’t been booted off Intrade, my money would be on a movie that attracts high spenders, thrill seekers, key influencers (or people who like to be connected to key influencers). 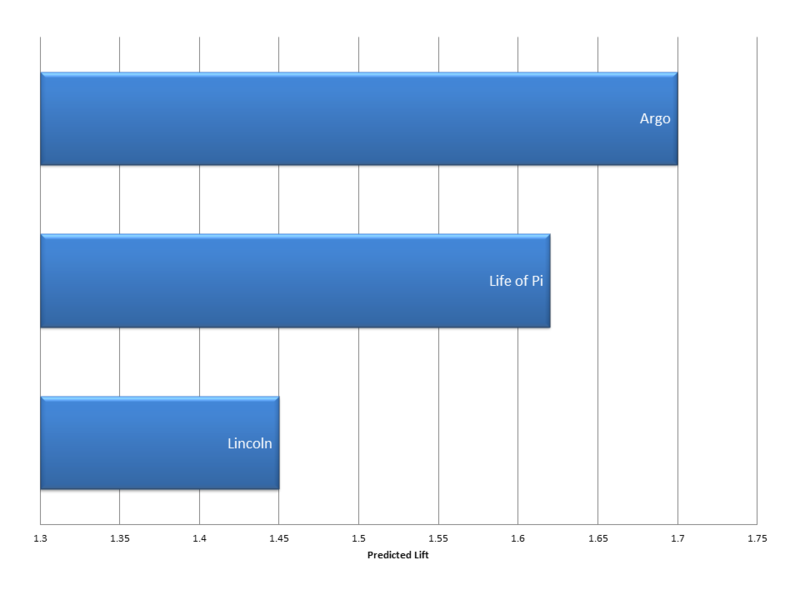 The Oscar goes to… Argo. This post is amazing! I wish I’d read it before the Oscars and saved myself some time. Love the water bottle piece.